The biggest question surrounding the Georgia State football team right now is who will be the starting quarterback in week one against Kennesaw State. 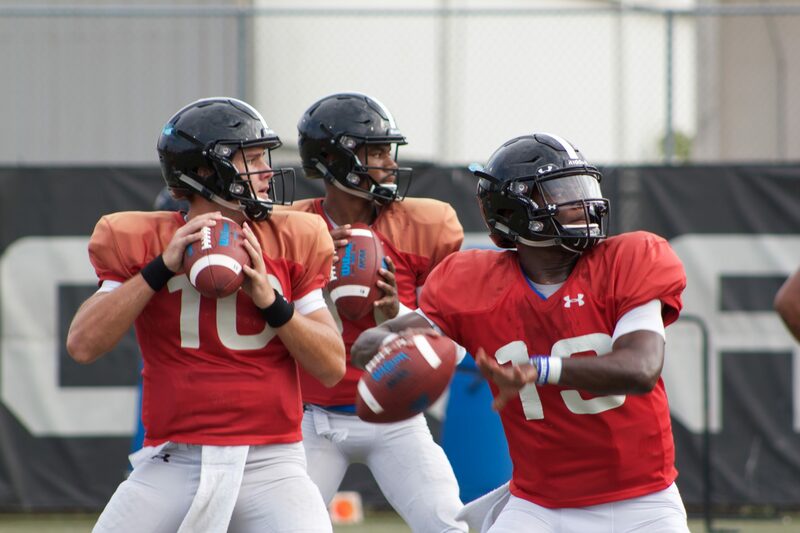 Last season was the best in school history, and the Panthers are looking to build off that momentum going into the future—and having a capable quarterback will be key. Conner Manning was the starting quarterback for two years, and he was a reliable one. Now that Manning is gone, someone will have to step up and take the job to push the program to the next level or at least maintain the same level of play. The Panthers have four quarterbacks vying for the starting role in Aaron Winchester, Dan Ellington, Jack Walker and Jaquez Parks. However, out of the four, Winchester and Ellington have separated themselves from the pack as the two most likely to start. Winchester is the longest tenured quarterback on the roster. This season will be his fourth with the program and one in which he hopes to break through and win the job. The redshirt junior has been in this type of battle before, having faced Manning two years ago and losing. But he still got some valuable playing time along the way over the past few years. Winchester has gone through several coaches and several offenses, but he is in year two with Trickett’s scheme, so that may give him somewhat of an edge. All in all, Winchester hasn’t seen extensive work in a Georgia State uniform, so his numbers are not jaw-dropping. Last season, he ran for a total of 79 yards in seven games of action. Winchester didn’t throw much last season, only passing nine times but he did complete six of them for 102 yards and one score. The 2016 season was more indicative of what Winchester could do on the football field; he ran for a total of 204 yards with one touchdown and threw another with 271 yards. Ellington has the most game experience between the two leading candidates. The junior is a transfer from Itawamba Community College in Mississippi. He was the backup during the 2016 season and the starter during the 2017 season. Ellington performed well in his one year as the starter as he threw for 3,211 yards and 27 touchdowns. He also ran for eight touchdowns and led the team for two straight seasons in that category. “If I could recruit Dan Ellingtons every year, my job as an OC would be really easy,” his Itawamba offensive coordinator, Chad Cook, said. Ellington averaged a cool 356.8 yards per game and was a Second Team National Junior College Athletic Association All-American selection in 2017. The starting competition is down to two players, but the coaching staff feels comfortable with all four candidates. Parks is a redshirt senior who has been at Georgia State for three seasons now. He started his career at Kennesaw State before transferring to Hinds Community College in Mississippi. While at Hinds, Parks threw for 1,427 yards and totaled 21 touchdowns, with five coming on the ground. After his year of service at Hinds, he came to Georgia State where he has been a backup since 2016. Walker came to Georgia State in the 2017 recruiting class, and he redshirted during his freshman year. The Mississippi native was a three-star recruit out of Madison Central High School. There’s only one starter, but multiple guys could see time this season depending on the different offensive formations and variations. Whoever wins the job will be working with offensive weapons fairly new to being heavily featured. Returning are running backs Taz Bateman and Demarcus Kirk and of course the nation’s leading receiver, Penny Hart. But outside of those three, the skill players are relatively young, so everyone will have a hand in shaping what the Panthers’ new offensive identity will be.